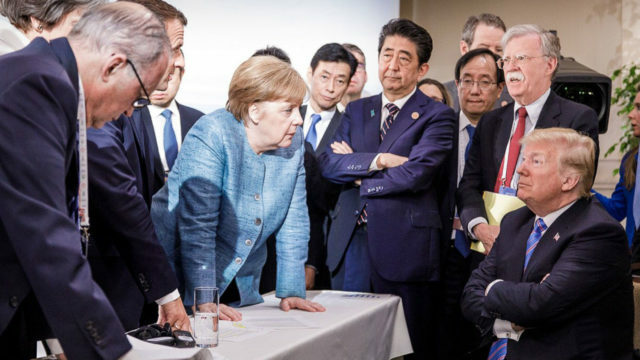 A photo posted by the German government showing a determined Angela Merkel standing up to an intransigent Donald Trump appears destined for the history books, summing up the deep fractures left by a disastrous G7 summit. The already iconic picture by Berlin’s official photographer at the gathering in Canada, Jesco Denzel, set social media alight when it appeared on Saturday, hours before Trump ripped up the hard-fought summit conclusions in an angry tweetstorm. 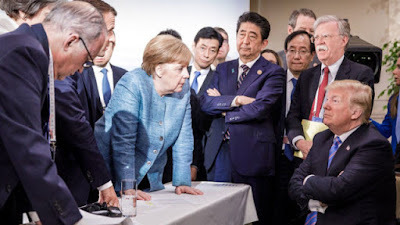 The image, which drew comparisons to a Baroque painting, shows Merkel standing at the centre of the frame leaning across a table before a seated Trump, his arms crossed in defiance. Looking focused or exasperated depending on the viewer’s interpretation, Merkel is flanked by British Prime Minister Theresa May and French President Emmanuel Macron, their faces largely obscured. Shinzo Abe of Japan looks on with a world-weary expression. Many saw a distillation of a crisis of the West in the photograph, and a revival of the debate launched by US and British media after Trump’s 2016 election whether Merkel was the new “leader of the free world”. National broadsheet Sueddeutsche Zeitung noted the moniker had made Merkel “uncomfortable” at the time. Other observers underlined a victory for Berlin’s spin doctors. “A hands-down public relations triumph for Germany,” news weekly Der Spiegel said of the picture that seemed to capture the world’s imagination. A winner, however, is in the eye of the beholder. Elisabeth Wehling, a US-based political linguistics researcher, tweeted that the body language clearly pointed to Trump dominating the scene. “1:0 for the US president! Sitting while the other stands is a classic strategy of gestural framing, to establish one’s own authority and propagate it via pictures — it works on global media because it transcends language barriers,” she wrote. US National Security Advisor John Bolton, who stands next to Trump in the picture, tweeted it during the summit to tout the America First message. “Just another #G7 where other countries expect America will always be their bank,” he wrote. “The President made it clear today. No more. (photo by @RegSprecher),” crediting Merkel’s spokesman Steffen Seibert’s account for the image for good measure. Seibert said laconically Monday that he had posted the photo on Twitter and Instagram simply to “give an overview of the chancellor’s work and the intense working atmosphere at a G7” summit. Regardless of the interpretation, the image succeeded in launching an internet-wide caption contest. Belgian Guy Verhofstadt, who heads the European Parliament’s liberal group, chose the tagline: “Just tell us what Vladimir has on you. Maybe we can help,” in a tart reference to alleged collusion between Russian President Vladimir Putin’s government and the Trump team to influence the US presidential election. “This looks like an episode of Celebrity Apprentice where Trump is about to fire Angela Merkel because her strudel marketing plan fell through,” Washington-based comedian Tim Young tweeted. Doctored images showed the US president as a petulant child — including memes with Trump overturning a bowl of noodles on his head or clutching a teddy bear as Merkel sternly looks on. But the humour couldn’t mask a deep sense of unease that the end of transatlantic partnership was nigh. Far from taking a victory lap, Merkel told German public television late Sunday that she found the summit’s implosion “sobering and a little depressing” and called it a “momentous step” taken by Trump. Foreign Minister Heiko Maas, whose office for the first time in the history of the republic has reportedly ordered an overhaul of Germany’s US policy, went further. “You can destroy an incredible amount of trust very quickly in a tweet,” he said. Germany, Europe’s top economy, finds itself in the sights of the US president due to its large trade surplus and defence spending criticised as too low by NATO. Merkel acknowledged that the moment had arrived for Germany and Europe to rethink their role in the world. The European Union must develop “a joint strategic culture”, she said, “otherwise Europe will be ground up in a world with very strong poles” of power elsewhere.